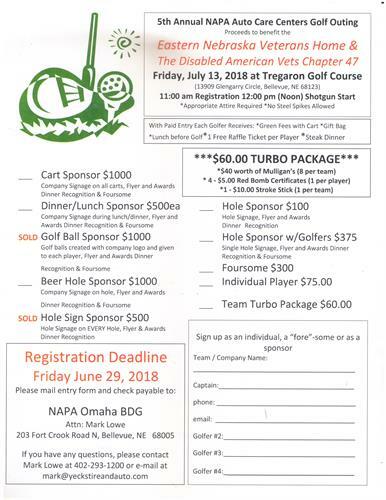 The Omaha area NAPA Auto Care Centers will be holding their 5th Annual Golf tournament benefitting the Eastern Nebraska Veterans Home and the Disabled American Veterans Chapter 47. To date we have raised over $13,000.00 for both of these organizations. Lunch and dinner will be provided with raffles, door prizes and silent auction items available. Friday, July 13, 2018. Registration starts at 11:00 am and shotgun start at 12 noon. Lunch will be served at check in and dinner at the end of the event.